A call to Sandra Totten at Dolphin Yachts confirms that she and Andre Barbier have sold the 27m motor yacht Lady Talitha, listed by Moncada di Paterno. 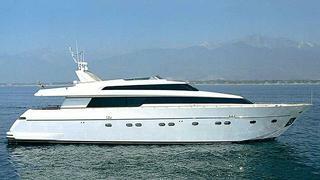 A Sanlorenzo 88 model built in 2003, Lady Talitha features a classic interior accommodating eight guests in a master suite, VIP stateroom and two twin cabins while twin MTU 16V 2000 M92 engines give her a maximum speed of 26 knots. Lady Talitha was asking €1.8 million.